If seeing your first robin or watching the crocus beginning to surface makes you cringe, you are likely one of the millions of people who suffer from spring allergies in Overland Park every year. Before you run to the pharmacy for the nearest decongestant, consider acupuncture treatment of allergy symptoms that can include runny nose, congestion and watery eyes. There is potential for allergies to be cured by the use of acupuncture. The only way to learn how acupuncture will alleviate your allergies is to try a few sessions with a certified Overland Park Acupuncturistand see how you feel. The goal of any allergy sufferer should be to take as little prescription medication as possible and still be free of allergy symptoms. 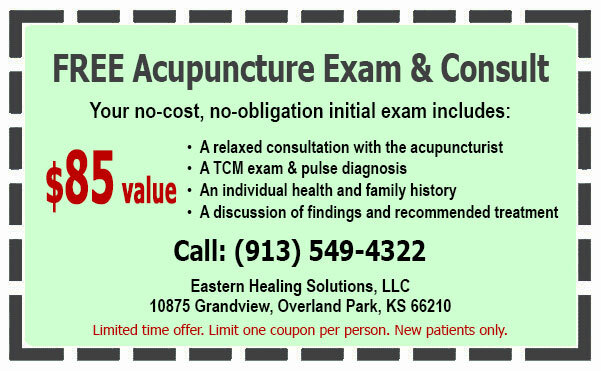 We want to thank you for visiting our Overland Park acupuncture for allergies web page, and in return we’d like to offer you a coupon for a FREE Initial Exam ($85 value.) This coupon is good for one initial exam and limited to one coupon per person. If you, your friends, relatives or colleagues are ever in need of my services, please print out the coupon and bring it on your first visit. If you have any questions send me an e-mail or call us at (913) 549-4322. I’ll be happy to answer your questions and discuss your concerns. PS--It’s fast and easy to share this website with a friend, just click here. "The doctor of the future will give no medicine, but will interest his patients in the care of the human frame and in diet and in the cause and prevention of disease." -- Thomas Edison.